"For consistency, versatility and a sound that is truly unique - Paiste is the only choice." Paul started playing drums at age 16 in various Sydney cover bands. At age 19, he was discovered by Iva Davies and asked to join the band, Icehouse. This began his professional career and an association with Icehouse spanning two decades and which still continues today. Recording with Icehouse resulted in the albums 'Measure for Measure' and 'Man of Colours' produced by David Lord. Man of Colours was one of the highest selling Australian albums of all time which included two top-ten hits in the USA Billboard Charts for record company Chrysalis Records. The following albums 'Code Blue' produced by Nick Launay, and 'Big Wheel' produced by David Lord, added another three top-twenty hits to the collection. Icehouse toured extensively throughout Europe, America, Australia and New Zealand numerous times. Touring highlights include touring the US with The Cars, playing at Madison Square Gardens in New York City, the prestigious Montreaux Pop Festival in Switzerland, American TV shows "The Johnny Carson Show", "NBC Today" and Top of the Pops UK. Paul has proven his versatility, recording and playing with many Australian & international artists and bands including Anthony Callea, Doc Neeson's Angels, Swanee, Max Sharam, Marcia Hines, Jenny Morris, Vincent Stone, Richard Clapton, Brian Cadd, Maybe Dolls, Nikka Costa, John Oates (Hall & Oates), Primary, Ian Moss, Choirboys, Machinations, Russell Morris, Jimmy Keays, Darryl Cotton, The Whitlams, and Sneaky Sound System to name a few. In 2003, he played on albums for the band Lo-Tel (Sony Music) produced by Rick Will, and solo artist Duncan James (BMG), produced by Andy Gill. He toured with both bands, including national tours along side John Maher and Blondie. Paul continues to play with Iva Davies and Icehouse who were inducted into the APRA and ARIA Hall of Fame in 2006. Icehouse are regularly invited to play at large events and concerts throughout the nation, such as the televised 2005 Australia Day Concert at Parliament House Canberra to a live audience of 30,000 in January. 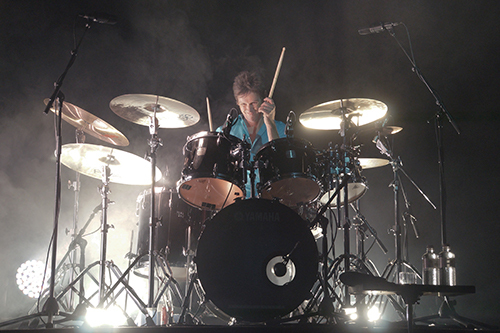 In 2007 and 2008, Paul played drums for Iva Davies for numerous corporate events in Australia and New Zealand. Paul toured Australia with the Countdown Arena Spectacular playing with Choirboys and Alex Smith (Moving Pictures) in all capital cities. In 2006/07 he toured with Choirboys, Noiseworks and Ian Moss in all capital cities and regional areas. Paul also plays for country music artist Adam Brand, as well as many other country music artists including James Blundell and Dianna Corcoran. He has toured nationally with Adam several times and has performed on the Today Show and Mornings with Kerri-Anne. He has also played at festivals such as the Tamworth Country Music Festival in 2007 & 2008. In 2007 and continuing today Paul has been touring with Sneaky Sound System performing in entertainment centres, theatres, and festivals around Australia and New Zealand. TV appearances with Sneaky Sound System include "The Panel Christmas Wrap", Rove Live and Sunrise. Paul has recently completed drum tracks for their forthcoming album.